Welcome! I am participating in the Mini-BlogHop for CardsforHeroes.org, a great organization that supports our nation’s armed forces by sending blank greeting cards to write home on, as well as cards of gratitude to encourage them. Please click HERE to visit this amazing organizations website and learn more about them! Want to get involved? Click HERE. Have no idea what I am talking about and want to start the Hop at the Beginning?!? Start Hopping HERE on August 15th, and all weekend long! Have you tried the KISSING TECHNIQUE lately? It makes for some mighty unique and coordinated stampin'! This basic technique adds texture to solid stamps. Want to add some pizazz to your Alphabet sets? Get more from the sets you have been using alot? Add spice to otherwise plain ole stamping?This is the trick! Ink a texture stamp (one with lines, dots, etc.). Place it face up on your work surface. Ink a solid stamp with a lighter color. Press the solid stamp into the texture stamp so they "kiss" each other. The background stamp leaves a pattern on the solid tamp. Stamp the combined image on cardstock. The result is a subtle or textured version of the solid stamp. (Optional) To add a darker border around the image, run your marker around the edge of the image. Stamp image on cardstock & Finish your card. You can also press inked stamps onto a background stamp and then stamp either stamp for an interesting effect. Or instead of using a background stamp, ink up a small stamp with dark ink and stamp it directly on your solid stamp. Now get out and try it - and start setting aside those cards for CFH and our men and women far from home!! For more inspiration visit the NEXT STOP ON THE BLOG HOP <-- click on it! Blessings on our Nations Armed Forces, and the families that support them! Lets bring some bright spots to the holidays this year for them! 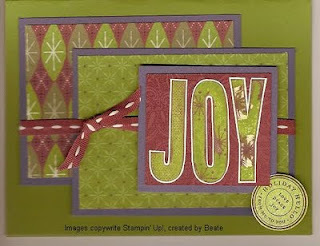 Love the colors you used in this card!! The layering is beautiful!! Great work! What a very lovely blog, it's so bright and cheery and I love it. Your card is really nice too! I love the colors here! Thanks for supporting cfh, I also like your count down clock...cuteness! Oh I love it too Angie! I am definitely going to have to try some smooching! No wait, kissing with my stamps! MMMMMWAH! Thanks for sharing Beate's card & technique, that woman regularly inspires me, too, lol! Thanks for joining in our hop! Beautiful card. Thanks for the step by step technique! TFS! I am going to have to try this! I love the kissing technique! Thanks for the reminder! Great card LOVEN it!!! love this! such a bright fun card and a great technique. Green and purple. One of my fav combinations for the holidays. Thank you for sharing. Love the colors of your card. Thanks for the technique and tutorial. Pretty Card! I've heard of this technique and I've seen it done, not sure why I've not tried it yet. What a wonderful card! I love your color combo and the layers!! I saw the kissing technique at Stamp TV. Now, it is good to learn that you can do it even with alphabet stamps. Thanks for sharing. Fun technique, thanks for sharing it! Very cool card, very fun technique! Thanks for the inspiration! Love your colors. I'll have to check out the technique and give it a try. when you stopped at my blog, you asked about my dp for my CFH card. I think it might be from making memories. Love that idea! I also like the layering on your card, and the ticker tape you are using for the CFH holiday deadline. Beautiful card! Thanks for the inspiration & for supporting CFH. great card and thanks so much for the technique! Love your card and the colors that you used. "Joy" is one of my favorite words! Very pretty card. Thanks for the kissing idea.